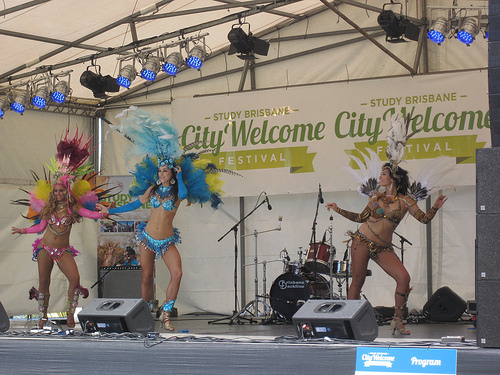 Every year, Study Brisbane hosts a City Welcome Festival for international students. This is a special opportunity to attend the Lord Mayor Graham Quirk’s Friendship Ceremony, learn about various different places in Brisbane, and meet new friends! The festival was held in a new location this year at the Cultural Forecourt in South Bank. The day was filled with so many booths, food vendors, performances, and activities for everyone to do. The Lord Mayor’s Friendship Ceremony kicked off the festival and students had the chance to take a photo with him. The beautiful skyscrapers of the city and river provided a great backdrop. The festival has a history of rain but we broke that mold this year with a sunshine-filled day. The event was also our last official Brisbane International Student Ambassador (BISA) event. It still hasn’t really hit me or set in as I have enjoyed every moment of being part of this fantastic program. The activities that I have been able to participate in such as the Lord Mayor’s Multicultural Dinner, Mercedes Benz Fashion Week, and Moreton Island Adventures Glamping Getaway have been unforgettable. The people that I have met through this program have become lifelong friends and I look forward to staying connected with Brisbane for many years to come. With some decisions in life, the outcome cannot be foretold and in this case, applying to be a BISA when I first arrived in Brisbane was one of the best decisions I have made when reflecting upon my past twelve months. Building strong relationships between countries and cultures are vital for better understanding at all levels whether local, regionally, or globally. I feel that I have positively contributed to better understanding of America and American culture with not only Australians but many other cultures around the world. Brisbane is filled with so many diverse cultures and makes for a wonderful place to live! A few highlights from the main stage included Strings for Ammo and the Sambalicious Dancers! I attended the networking workshop at the Work Skills tent and made time for a a few snapshots at the photo booth to remember the fun day. The Omani Society was also doing henna for the ladies so a few friends and I had to stop by. The food vendors were great. I absolutely loved the Passion Tree Passion Bingsoo that is filled with shaved ice, mixed cut fruits, strawberry sauce, and ice cream! I highly recommend it and hope that you’ll grab one on a hot day. The festival was a great success and I hope that as an international for domestic student, you’ll be sure to mark this for your calendar for when you come study in Brisbane! « Happy 109th Birthday Rotary!